Topic: Monkey Island Ultimate Talkie EGA? Re: Monkey Island Ultimate Talkie EGA? @LogicDeLuxe interested in a hack? Is it possible to use Ultimate Talkie with the 16-color ega version of MI? Thanks, but I can't read that. Can you tell me which order the stretching occurs? Still wondering if it's possible to use the original sound effects with ultimate talkie? Love the vocies but hate the new sound effects. Is there a framecap or framerate limit in ScummVM? I'm interested since a lot of games for it wouldn't go much about 60fps, usually about 30fps. Is there an actual cap on the rendering side of ScummVM at all? 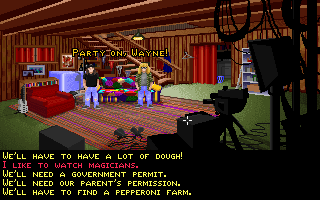 FRAPS gives me 100+fps for ScummVM running Maniac Mansion. Topic: Does ScummVM use hardware or software rendered cursors? Does ScummVM use hardware or software rendered cursors?